Helsinki Climate March, 29th Nov 2015. Photo (c) Meela Leino. One Ecomodernist banner is visible on the right; another one was attacked, unfortunately. Last Sunday, members of the Finnish Ecomodernist Society participated in the worldwide Climate March in Helsinki. This was probably the first time ecomodernists took part in a demonstration, and as such, a historical moment. Four countries, four histories of CO2 reductions. Data from World Bank and CDIAC carbon database. In order to avoid dangerous climate change – a calamity that would disproportionately hit the world’s poorest and most vulnerable – we now need to reduce our greenhouse gas emissions at a rate exceeding 3 percent per year for the next 35 years or more. This is a monumental task, to put it mildly. Given the stakes, the need, and the short time available, one would assume the world leaders would take a look at historically achieved emission reduction rates. However, evidence suggests this hasn’t been happening. How otherwise should we explain that climate discussions still raise Germany’s Energiewende policies to the pedestal, while completely ignoring those countries who have actually managed to reduce emissions at or nearly at the rates now required? This graph, based on CDIAC carbon emission database and World Bank statistics, tracks the history of per capita emissions and identifies the best 10-year period of emission reductions. As you can see, in this historical light the achievements of that paragon of climate policies seem more like dismal failure than an example to be followed. At least three countries (as well as additional examples such as Switzerland) have accidentally implemented better climate policies than what the “best” climate policy so far has delivered. Two of these, France and Sweden, have produced at least 80 percent of their electricity from low-carbon sources since 1990. This 80 percent happens to be the goal Germany is striving for – by 2050! What’s more, these policies were enacted against a backdrop of rising electricity consumption per capita, whereas German policy relies on ambitious energy saving schemes coming to fruition. In every field imaginable, it would be very bad news indeed if accident and chance repeatedly delivers better results than the “best” policy promoted. We need to raise our voices to ensure policy-makers stop burying their heads in sand and take a hard look at the measures that have actually and repeatedly been able to reduce emissions at rates now required. Anything else is a huge gamble with the climate and our living world. For more information, get our book Climate Gamble, either from online stores or by coming to Paris during COP21 negotiations where we’re handing out nearly 5000 copies for free. The book lays out the scale of climate challenge, as understood by most recent scientific studies, and the scope of solutions proposed to mitigate the dangers. Through IPCC and other studies, the book shows that mitigation plans that rely on renewable energy and energy efficiency alone are highly unlikely to succeed in time: we now need all the options, including nuclear power. 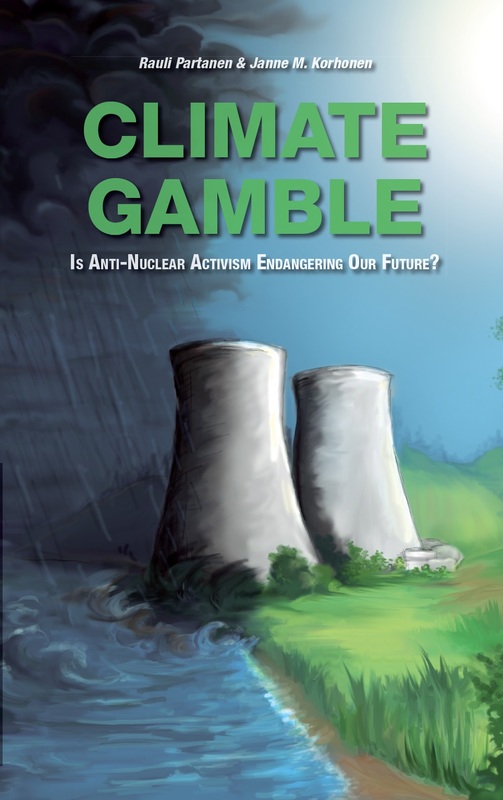 The book also shows how the global anti-nuclear movement has consistently twisted and misrepresented the facts and even resorted to fabricated statistics as it continues its 1980-era battle against nuclear energy – despite all the evidence that the 21st century sorely needs all low-carbon energy sources possible. Non-profit crowfunding campaign collected enough money to print about 5000 books, which will be handed out free of charge to interested parties in Paris between 28th November and 12th December this year. Taken together, the independently written and published book has sold nearly 8000 copies in Finnish and English. French and Czech translations are scheduled to appear in 2016 as well. According to the two authors, it is obvious that if humanity wishes to prevent dangerous climate change, it cannot be too selective about the methods required. All the feasible solutions need to be considered, and nuclear power has track record of rapid, effective emission reductions. To act otherwise and limit solutions based on outdated, mostly unscientific preferences is a foolish gamble with the climate. In Paris, the duo will be distributing the books as well as taking part in several events either as speakers or in the audience. They will also take part in filming of a documentary, network with international energy and climate researchers and activists, and try to meet up with perhaps the most famous climate researcher of the world – Dr. James Hansen. Hansen, alongside with his three colleagues, Drs. Tom Wigley, Ken Caldeira and Kerry Emanuel, will be in Paris to deliver very similar tidings as Climate Gamble: mitigating dangerous climate change will almost certainly require radical expansion of not just renewable but also nuclear energy. In light of the urgency of tackling climate change and nuclear power’s essential role in limiting temperature rises, the four scientists will therefore challenge environmental leaders who still hold anti-nuclear positions to instead support development and deployment of safe and environmentally-friendly nuclear power. We must say that it is great to be a small part of this process of getting evidence and science back to the climate policies of the world. This is very encouraging, and we sincerely hope that climate activists of all persuasions refuse to gamble with our climate any more, and start backing the science on the matter. It is the good, responsible and sensible thing to do. It is these paths we now choose that our grandchildren will judge us upon. We are also very pleased to be attending various events with said top scientists during COP21. It should be highly interesting and very enlightening. Below is the full media alert from here. James Edward Hansen is an American professor at the Columbia University Earth Institute. Hansen is best known for his research in the field of climatology, his testimony on climate change to congressional committees in 1988 that helped raise broad awareness of global warming, and his advocacy of action to avoid dangerous climate change. In recent years, Hansen has become a climate activist for action to mitigate the effects of climate change, which on a few occasions has led to his arrest. From 1981 to 2013, he was the head of the NASA Goddard Institute for Space Studies in New York City. As of 2014, Hansen directs the Program on Climate Science, Awareness and Solutions at Columbia University’s Earth Institute. The program is working to continue to “connect the dots” from advancing basic climate science to promoting public awareness to advocating policy actions. Tom Wigley is a climate scientist with the University of Adelaide and the National Center for Atmospheric Research. He was named a fellow of the American Association for the Advancement of Sciences (AAAS) for his major contributions to climate and carbon cycle modeling and to climate data analysis, and because he is “one of the world’s foremost experts on climate change and one of the most highly cited scientists in the discipline.” He has contributed to many of the reports published by the Intergovernmental Panel on Climate Change (the work of the IPCC, including the contributions of many scientists, was recognized by the joint award of the 2007 Nobel Peace Prize). Ken Caldeira is a climate scientist at the Carnegie Institution for Science, where his job is “to make important scientific discoveries.” He also serves as a Professor (by courtesy) in the Stanford University Department of Earth System Science. Caldeira is a member of the committee producing the 2015 U.S. National Academy of Sciences report “Geoengineering Climate: Technical Evaluation and Discussion of Impacts.” He is also a contributing author to the Intergovernmental Panel on Climate Change (IPCC) AR5 report Climate Change 2013: The Physical Science Basis. In 2010, he was a co-author of the 2010 US National Academy America’s Climate Choices report and was elected Fellow of the American Geophysical Union. He participated in the UK Royal Society geoengineering panel in 2009 and ocean acidification panel in 2005. Caldeira was coordinating lead author of the oceans chapter for the 2005 IPCC report on Carbon Capture and Storage. (1) Nearly every serious look at the energy technology required over the next several decades to supply the world’s growing energy appetite while effectively mitigating climate change has concluded that there is likely to be a need for large amounts of nuclear energy. In 2014 alone, reports from the Intergovernmental Panel on Climate Change, the International Energy Agency, the UN Sustainable Solutions Network and the Global Commission on the Economy and Climate argued for a doubling or trebling of nuclear energy – requiring as many as 1,000 new reactors or more in view of scheduled retirements – to stabilize carbon emissions e.g. Intergovernmental Panel on Climate Change, Working Group III – Mitigation of Climate Change, http://www.ipcc.ch/report/ar5/wg3/, Presentation, slides 32-33; International Energy Agency, World Energy Outlook 2014, p. 396; UN Sustainable Solutions Network, “Pathways to Deep Decarbonization” (July 2014), at page 33; Global Commission on the Economy and Climate, “Better Growth, Better Climate: The New Climate Economy Report” (September 2014), Figure 5 at page 26. Climate Gamble gets a Foreword by David MacKay! We are very pleased and excited to announce that Prof. David MacKay wrote the foreword for our latest edition of Climate Gamble, which we will be distributing in COP21 climate negotiations in Paris (as part of our campaign). David MacKay, for us, is a champion for evidence-based policy and fact-based energy discussion. His ground-breaking book Sustainable Energy – Without the Hot Air (free pdf) has been a very big inspiration to both of us, and one of key books that lead to writing Climate Gamble. He is also the Former Chief Scientific Advisor, Department of Energy and Climate Change in the UK, and has numerous other distinctions as well.